Click on the name of any course you're interested in, and information will expand, showing links for more information that will take you to course specifics and registration forms. Check back! More Kinesiology videos to come. 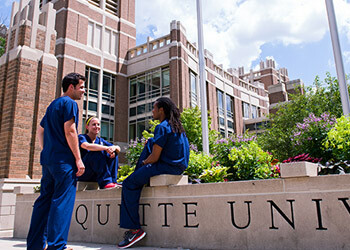 This program is recognized by the American Physical Therapy Association (APTA) as a Clinical Instructor (CI) Education and Credentialing Program and is being sponsored by Marquette University on behalf of the WI Clinical Education Consortium. The program was developed through a grant funded by APTA under the direction of principal investigator Michael J. Emery, Ed.D., PT and with co-investigators Nancy Peatman, PT, M.Ed. and Lynn Foord, MS, M.Ed., PT and with materials used by the New England Consortium of Academic Coordinators of Clinical Education, Inc. It takes 15 hours to complete the entire program for CI Education and Credentialing. This voluntary program is designed for physical therapists and physical therapist assistants who have supervised or overseen the supervision of at least one student in clinical practice, or have been actively involved in student learning and education since receiving the APTA CCIP Level I credential. Clinicians from other health care professions who have completed CCIP Level I and meet the above student supervision criteria are also welcome to participate. Program participants must complete prerequisites including completion of a CCIP Level II Participant Dossier, a series of three online professionalism modules, and review of four articles, in addition to completing a live 2-day program with an Assessment component. Successful completion of the course provides credentialed CIs with 1.7 CEUs and the APTA CCIP Level II credential. Clinicians from other health care professions who complete CCIP Level II are eligible to receive 1.3 CEUs, but would not be awarded the Level II CI Credential. June 19-22, 2019 - course is confirmed as of 2/21/19. An intensive 4-day study of the anatomical and psycho-physiological principles essential for the development of effective treatment programs. This is an advanced three-day course designed for nurses, physical therapists, occupational therapists and other health care providers who are seeking a better understanding of the various bowel disorders that affect children, women and men; and the specific rehabilitation strategies that are useful in treating these disorders. This 3 day course is designed for licensed health care professionals such as physical and occupational therapists, nurses, nurse practitioners, and physician assistants who are working in the area of pelvic floor dysfunction and looking to expand their knowledge with specific patient populations and treatment considerations. Clinicians will be provided with the rationale and tools to address Sexual Function and Wellness and provide strategies for treatment of Chronic Pelvic Pain. Specific content and detailed information on these topics is provided below. This course consists of an exciting three-day anatomical dissection of the brain and spinal cord, as well as a compelling review of recent advances in functional neuroscience. Participants will work in groups and be allotted three afternoons to perform regional dissections on embalmed human cadaveric material. The faculty consists of neuroscientists and clinicians qualified and experienced as neuroanatomical instructors. Faculty members guide 12 hours of dissection in the afternoons. These sessions are complemented by three morning lecture sessions enriched by slide, video, computer animation and microscopic presentations.